February 7th, 2014: I complete this latest post on my 30th birthday and mentally prepare myself for a new and exciting decade while attempting to ride my mini motorcycle from Patagonia all the way home to Seattle. ETA: July-August, 2014. Wish me luck, friends. With the Carretera Austral behind us and back in Argentina, we ride east to the town of Perito Moreno and then south to Gobierno Gregores. The verdant green hills of Chilean Patagonia have turned to harsh plateaus, sandy hills and scrub as we once again cross the border into the barren rain shadow of the Andes range. Llama-like animals called “guanacos” peer at us curiously before bolting, levitating their slim forms gracefully over the fence that lines the route. You can see the power in a kangaroos jump, but the guanacos just float effortlessly over the barrier in high elegant leaps, like clouds drifting tranquilly over the arid plains. Every now and then a large carcass decomposes, legs still tangled in the lines of the fence. A terrible death, likely very slow and painful, unable to free themselves from the man-made structure invading their native land. I hold my breath as they pirouette over, praying for a safe landing. In the next few days and several hundred kilometers, we battle extreme winds and gravel roads southwest towards El Chaltén. A wrong turn sends up southeast with a strong tailwind, blowing us in the opposite direction for a gloriously speedy 60km before realizing the mistake and turning around to fight the wind back. Every day is grueling in these conditions, but I enjoy every moment of it. Ruta 40 is more paved than we expected, but even so we rarely get above 65km/h with the brutal gusts blowing us all over both lanes. The headwinds are more bearable than the sidewinds, which crank our necks at an awful angle until our shoulders and backs burn with pain. We play with slip-streams and riding formations such as the “Mighty V” to help Kath’s bike battle the winds, which has lost some power recently. We sometimes go 60km down a perfectly straight road and only see a handful of cars. Hitchhikers have become very scarce, unlike in Chilean Patagonia, and even bicyclists are few and far between. We ride slowly and cautiously, knowing help would be hours away if anything were to happen on the long stretches of desolate gravel roads. 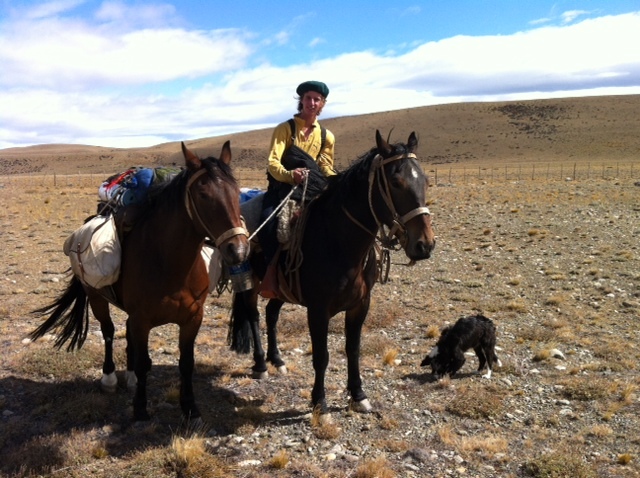 100km from El Chaltén I meet Quentin, a young Frenchman alone on horseback in the bleak wilderness. He worked for three months on a farm in El Calafate in exchange for two horses, before setting off to traverse Argentina south to north. Before departing, a gaucho (an Argentine cowboy) gifted him a collie pup to keep him company. Two weeks before I met Joanna, a lovely curly blonde, blue-eyed and freckly Scottish girl alone on her bicycle, camping on the shores of a wild lake. Her mother had died the year before, leaving her a small inheritance. To honor her memory and adventurous spirit, Joanna set off to ride her bicycle from Canada to Ushuaia. Joanna tells me of a young German couple riding their bicycles from Alaska to Ushuaia with their baby in tow. I meet this lovely couple and their now 2.5 year old daughter at my camp just moments before sitting down to write this missive. It’s a reminder of the amazing adventures people are out having all over the world, and the possibility of experiencing things in such unique ways. 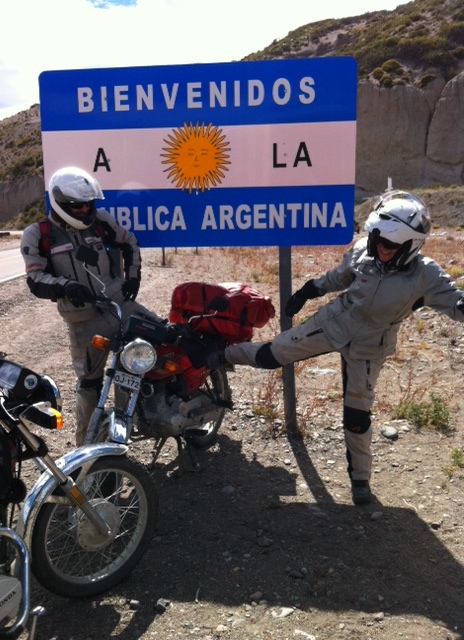 *More photos to come, as soon as the internet cooperates here in El Chalten. gorgeously written post – a pleasure to read. happy birthday, darling! Happy Birthday Elisa, and ride safely. We love reading about your travels and the people you meet. Happy Birthday from Pichilemu. Hope you plan to ride home to Seattle with your friends rather than alone. Happy birthday! Sounds like you gave yourself a heck of a 30th. If you make it through Oaxaca, I have some suggestions. Enjoy the ride. Troy, where are you now? And yes, I do hope to go through Oaxaca! Did you have a great time? I was there years ago, but didn’t explore nearly enough. I’m typing this from Oaxaca, on what amounts to Central Park West (Parque El Llano: http://www.exploringoaxaca.com/interesting-places,oaxaca-city,el-llano-benito-juarez-park/). It’s been incredible, especially for such a small city. That everything is within walking distance sure doesn’t hurt. This was just lovely Beads. You’re posts are always wonderful and so well written, but there are a few in here that are just poetic. This one just added itself to that list. I’m proud of you! Happy 30th Elisa! Have been wandering around your blog reading bits and pieces, will have to dive in deeper when I’m not working, because I can see I’m going to get lost for a while. Look forward to seeing more of your grand adventure, thanks so much for sharing. See you next summer! Thanks for the message! See you when I get home- hope you’ve been able to get on the river a bit this season! Haven’t been on the river in forever it seems, but at least getting in some good Jiu Jitsu time (between injuries anyway). Will be boating again soon though. Loving this blog! 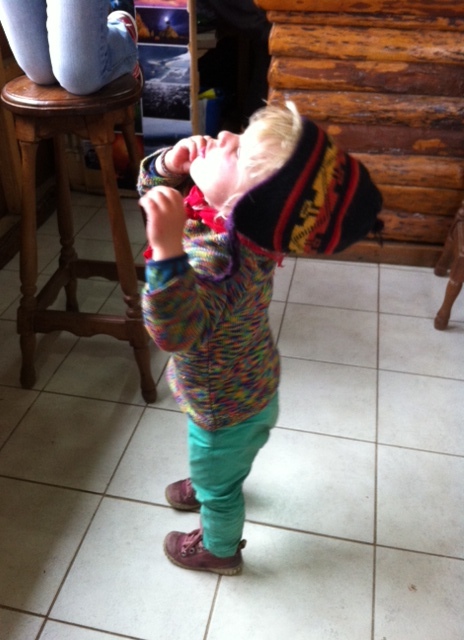 Thanks Elisa for keeping us more up to date than our keyboard averse son (Rob) does! Love to Kath and keep ‘living your dreams and having fun you guys.